The Armstrong Browning Library is a research library devoted to the study of the lives and works of the Victorian poets, Robert and Elizabeth Barrett Browning. 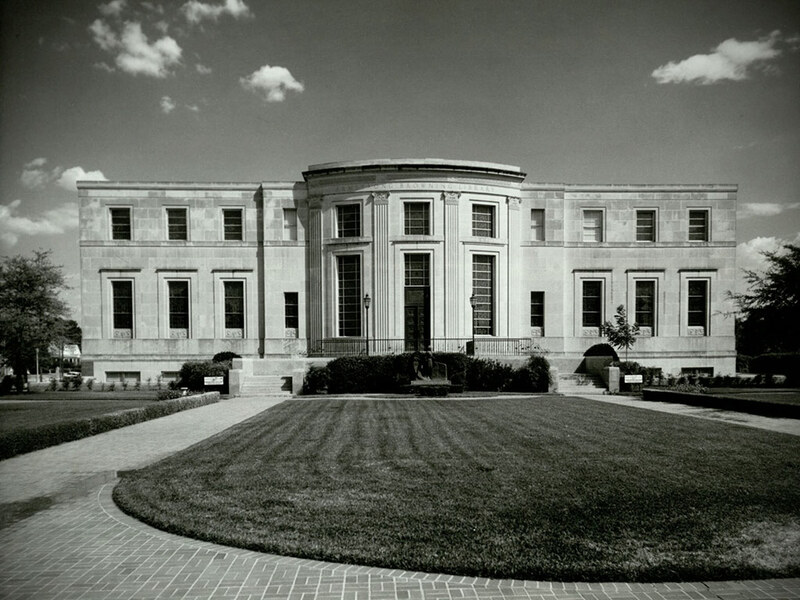 It houses the world's largest collection of books, letters, manuscripts, and memorabilia pertaining to the Brownings, as well as a substantial collection of primary and secondary materials related to 19th-century literature and culture. Included in the latter category are works by literary figures who were contemporaries and associates of the Brownings, such as Matthew Arnold, Charles Dickens, George MacDonald, Joseph Milsand, and John Ruskin. Growing collections of 19th-century women poets and 19th-century theological pamphlets are among its newest avenues of expansion. Students and scholars are welcome to conduct research using its extensive non-circulating collections. Dr. A. J. Armstrong, founder of the Armstrong Browning Library, became interested in Robert Browning at an early age and began to collect books and articles associated with Browning from about 1905. On his first visit to Italy in 1909 he met Browning's sixty-year-old son Robert Wiedeman Barrett Browning, known as Pen, who was living in Asolo, Italy, as a sculptor and artist. Armstrong was entertained there as Pen's guest for several memorable days; the visit produced in Armstrong a firm intent to pursue and acquire everything by or concerning the poet. Pen Browning died in 1912 without leaving a will, and to satisfy relatives and creditors the Browning heritage was dispersed during a six-day sale. His effects were sold in London by Sotheby's, during an auction held the following year, May 1 - 6, 1913. Soon after the sale Armstrong inquired of Bertram Dobell & Sons, book dealers in London, if there was a way to obtain the names of purchasers and prices realized at the sale. It was subsequently arranged that E. H. Courville, a Sotheby staff member, would provide this information. Courville secured an unmarked copy of the 161-page illustrated sale catalogue and, with access to the auctioneer's master copy (now on deposit at the British Library, London), duplicated the information into the margins of the unmarked copy. This "Courville Copy" can be seen at the Armstrong Browning Library. If Armstrong had not acquired this record of the buyers, it would have been far more difficult to locate items from the estate. This guide served as a starting point for Armstrong to pursue, and then either beg or purchase, every Browning item that he could find. Many of the Browning materials are now untraceable, but a surprising amount still surface as they come out of the hands of private collectors. In 1918, Dr. Armstrong donated his small collection of Browning books (mainly texts and commentaries) to Baylor University. For the rest of his life he dedicated a major part of his energy to raising funds: he cajoled, challenged, and beseiged donors and former students for gifts large and small; he banked the profits he made while conducting educational tours; and he booked performances for and hosted celebrities during their visits to the Baylor campus--in short, he raised money however he could to fund and expand Baylor's Browning collection. Initially, the Browning collection was housed on the open shelves of Baylor's main library, Carroll Library, but in 1922 a fire occurred. Fortunately, all of the Browning items were saved, so, during the renovation of the building, a special Browning Room was created and dedicated in 1924. As early as 1925, Baylor's Browning collection was clearly the largest single concentration in the world; equally clear was the need for a separate building for the vast and growing collection. In 1943, Baylor president Pat N. Neff offered $100,000 toward the construction of the library and challenged Armstrong to raise the remaining funds. Despite being slowed by a post-war economy, groundbreaking for the three-story Armstrong Browning Library was held on May 7, 1948, on the block of 8th Street and Speight Avenue, the southeast corner of the Baylor University campus. It was to serve a dual purpose: house the Browning collection in the top two floors and provide space for English Department classrooms and offices on the ground level. 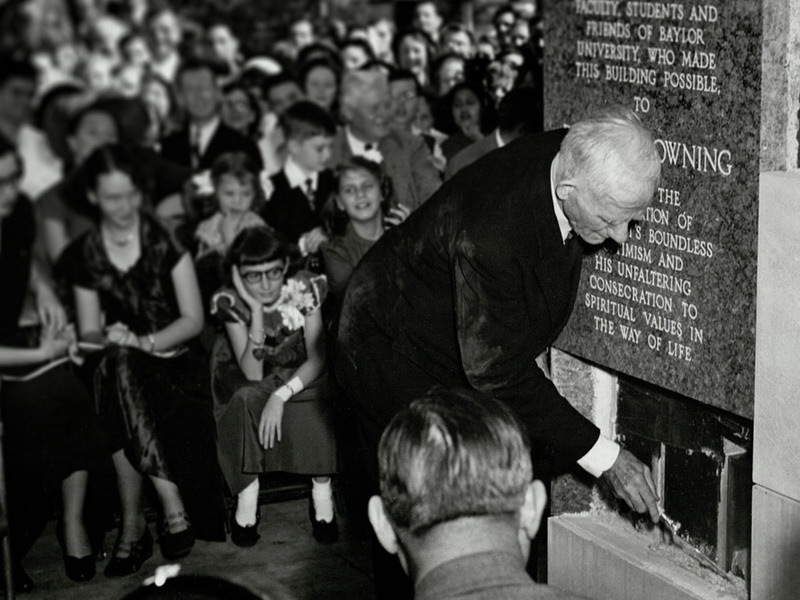 After twenty-one months of construction, a grand ceremony on February 25, 1950, gave donors and guests an opportunity to place over 60 items in the cornerstone of the building--items ranging from personal photographs and publications to tributes regarding Robert Browning. Finally, after another twenty-two months of painstaking work by builders and craftsmen, dedication ceremonies for the magnificent 1.75 million-dollar structure were held December 1 - 3, 1951, during a flourish of activities. The Browning collection has continued to grow, both in volume and importance, under the succeeding directorships of Mary Maxwell Armstrong (1954 - 1959), Dr. Jack W. Herring (1959 - 1984), Dr. Roger L. Brooks (1987 - 1994), Dr. Mairi C. Rennie (1996 - 2002), Dr. Stephen Prickett (2003 - 2008), Rita S. Patteson (2009 - 2016), and Jennifer Borderud (2017 - present). In 1995 a major renovation of the ground floor changed the existing classrooms and offices, formerly used by the English Department, into areas that were essential to compensate for the growth of the collection and expanded service to the general public. The floor was transformed into a ground-level entryway, formal reception area, gift shop, lecture hall, seminar room, and a desperately needed humidity and temperature controlled book stack area. In 2001 several refurbishment activities were undertaken to prepare for the celebration of the building's Golden Jubilee. Thanks to the Baylor/Waco Foundation and Baylor University, the building is once again enjoying its original splendor.